"Awe mom, chicken again?" will no family member say again if you make this delicious chicken. The flavors are simply amazing and it's crazy easy to make. I made up some Za'tar seasoning sans sesame seeds (because I'm allergic but) feel free to include them. After roasting for an hour the meat was perfectly seasoned, tender, and juicy. This is simply wonderful. Combine herbs, sumac, sesame seeds if using, and salt in a bowl with softened ghee or butter and olive oil. Cut all the way down one side of the chicken's back - an inch or so outside the spine. Use whatever knife works best, but a short serrated knife seems to work well. Once the back is split, open up the chicken (breast side up) and flatten it by hand. 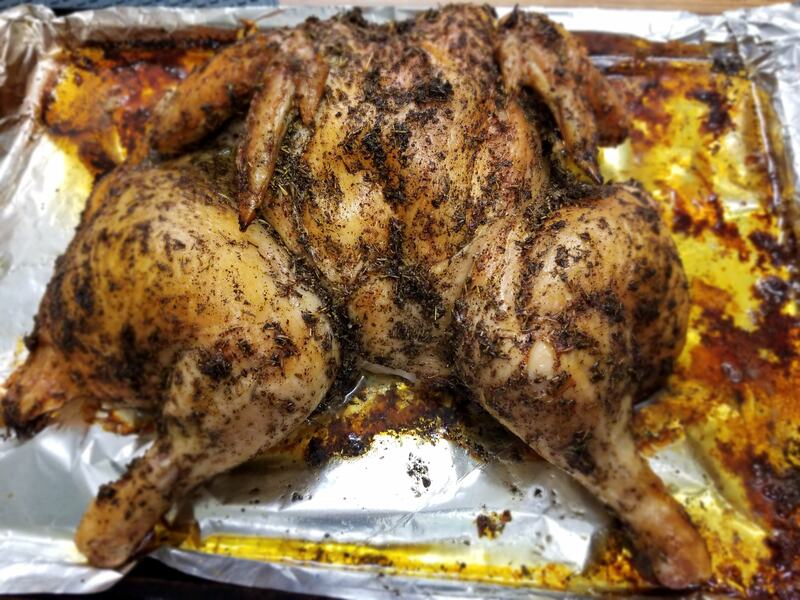 Lay chicken on a baking pan breast side down and rub spice mix into the meat. Turn over chicken and repeat on the breast side. Roast breast side up for one hour and enjoy!